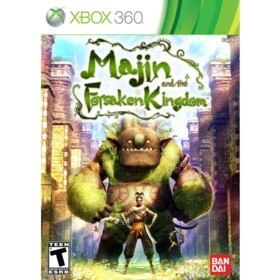 Majin and the Forsaken Kingdom is a Xbox 360 game in the Adventure genre. The game was published by Namco Bandai Games and developed by Game Republic. The game has an ESRB Rating of T (Teen 13+) and was released on 2010-11-23. The game's official site can be found at www.namcobandaigames.com/games/majin. Majin and the Forsaken Kingdom is an action adventure role playing game which takes place in a fantasy setting. The main characters are Tepeu (the human hero) and Teotl (the titular "Majin" guardian). The world in which Tepeu lives was once thriving with life and nature. One day, however, it became engulfed in darkness. A strange black goo now covers what was once a vast colorful kingdom. Tepeu, who grew up in the woods and can speak to its inhabitants, sets out to free the legendary guardian who he believes can help him save the kingdom and return it to its rightful place. Eventually, Tepeu locates Teotl - trapped inside a castle and very, very hungry :). Teotl has been trapped for years and all of his powers have been lost. Once Tepeu manages to free him they set about the world restoring his powers and getting to the bottom of why the Kingdom has deteriorated. The gameplay mechanics are very reminiscent of Overlord. Tepeu is the only character that you directly control and you give orders to Teotl who is controlled by the Artificial Intelligence. The orders you can give the Majin are fairly straightforward - such as attack, wait, crouch, and feed. By collecting various fruits and feeding them to Teotl you increase the Majin's powers. Similarly, by defeating enemies together you increase Tepeu's level and increase his "friendship" with Teotl. Increasing your friendship points unlocks various combination powers that can be performed in the heat of battle. Additionally, you can find new equipment for Tepeu to wear which not only changes his appearance, but his abilities as well. The general format of the game is - locate a new area, explore the area, find one of the Majin's lost powers in the area, and use the power you just found to defeat the boss of the area. I know it sounds overly simple, and it is, but the areas/powers/bosses are each very different and I never once felt bored during the 15 hours it took me to fully complete the game. The only somewhat annoying aspect was waiting until nighttime to collect the memory shard collectibles and the frequent backtracking you must do to move the story forward. The graphics of the game were very well done, if a bit dark. Given the "kingdom overrun with darkness" storyline this was to be expected - but it would have been nice if the game included an option to increase the brightness settings. The music and sound effects were by far the most amazing parts of this game. Everything sounds as though it is being performed by a live orchestra and the melodies are extremely memorable. The voice acting of the main characters was also very good - unfortunately, the voice acting of the animals was some of the worst voice acting I've heard in quite some time. The games controls were fairly responsive, though there were a few times that the Majin would not follow my orders since he was busy attacking enemies. The only real knock I can give against this game is its lack of replay value - once you have completed the main storyline and found all of the collectibles there really is no reason to play through it again. That being said, I really hope that Game Republic makes a sequel. It is definitely one of the sleeper hits of 2010. I highly recommended checking it out - at the very least it makes an excellent rental.